He will be in Michigan! 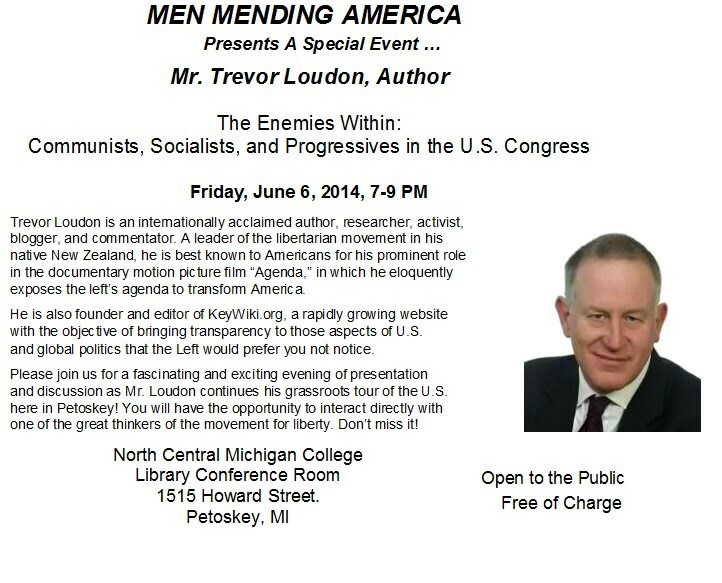 The Great Lakes Bay Speakers Forum presents “An evening with Trevor Loudon” from 7PM to 9PM. Following his presentation you can meet him, purchase a personally autographed book, and enjoy some great food/refreshments at the afterglow reception as well as mingle with your neighbors and friends from the area. The cost is $20 per person and tickets can be purchased on the web in advance at Eventbrite.com: An Evening with Speaker & Author Trevor Loudon . The Great Lakes Bay Speakers Forum is offering a special promotional $10 voucher towards the purchase of any Trevor Loudon book with all paid admissions to the event on Sunday, June 8TH only! Come out and take advantage of the special pricing! Wow.. a much more complete list here! I can only hope there are others out there in The Mitten who choose to free their minds of their Boobus Michiganderus shackles. FYI.. It was a great visit. Loudon spoke to a packed room. We will have video available soon! Excellent. Am looking forward to the video.